Of course, as with many such initiatives and programs, working with them is not always easy. Especially for newcomers KiCad is hard to get into, as it starts with the fact that somewhere around summer last year no more “stable” versions were released (a good explanation can be found here, see also here). Nightly builds are available, but it’s hard to find out which one is actually working and you’d have to build them from source. I myself am incapable of doing the latter. The KiCad User Mailing List is a great help when it comes to that and other questions. The project website is anything but up to date and lots of information is scattered around the webs on various sites. But it is constantly getting better. 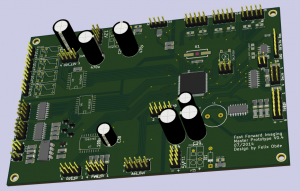 Sometime 2014 [KiCad.info] opened with an active [forum] and lots of tutorial videos. The forum is quite active and I just got a freshly built version for OSX (BZR5324) from there. Executables for windows and Linux can also be found here. The CERN has entered the project in 2013 and contributed a push&shove router and several other functions to the suite that were merged into the main branch this year. Great stuff! They also managed to set up a donation page so I could finally give some money to the project. I did two introductory workshops to KiCad so far, main problem being the fact that everybody present had a different version with diffferent bugs and features installed. Now I finally found something what I would call a fairly up-to-date and stable version and my colleague XeN was so nice as to install it on a virtual linux machine I can make available to future participants to use. This entry was posted on Friday, December 5th, 2014 at 13:33	and is filed under Blog. You can follow any responses to this entry through the RSS 2.0 feed. Both comments and pings are currently closed.